Provide simple and easy access to listening to the latest shot, using GStreamer to play back the shot. Have the ability to tweet/dent/Facebook the latest shot with one-click using the Gwibber API. List latest shots for one-click playback. 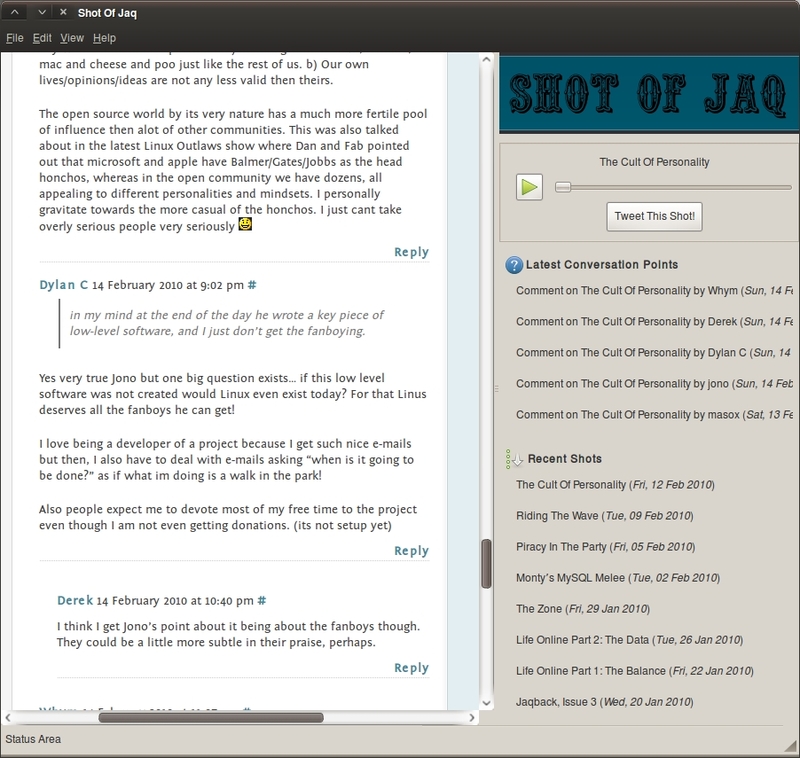 Show recent comments where you can click them to display them inside App Of Jaq and reply – this is shown using GtkMozEmbed. Keep right up to date with the latest comments as App Of Jaq shows latest comments in a pop-up bubble using notify-osd. Get one-click access to all the latest shots and other Shot Of Jaq resources with an application indicator menu. The application indicator: I don’t have the Shot Of Jaq icons yet, so I used the distributor-logo (hence the Ubuntu logo). I am still working on the first release but hope to have it ready in the next few weeks and added to a PPA. Ultimately, I am keen to replace the web view of the comments and have a native GTK-driven commenting interface, bypassing the website entirely. I am also keen to build our new Shot Of Jaq karma system into the desktop app too. I am going to leave these features for the second release though. You’ve gone opportunistic coding crazy. Good crazy! Maybe I can do this too.. Awesome but it would be cool if we had an easy way to get the apps on the desktop without having to manually add the ppa and install the software. Id love if there was a ppa section in the software store but thats just me. I just started playing with Quickly, Python and Glade (coming from AS3 and Java) and finding it super quick to adapt. Lots of ideas, just need to get 110% comfortable with Python and Glade and they are good to go. Quickly makes native apps a reality for someone like me, where previously I would have defaulted to AIR / Java. I prefer my shots on my mobile but I think this is a great example. Keep pushing opportunistic development. The cream always rises, so I don’t fear the slew of crap apps that may or may not come out of this movement. This sounds good, but I think Gwibber integration for Shot of Jaq would be even more brilliant to follow and add to the conversation. What an excellent idea. Nice work Jono. I like the idea of writing a Java version which would be cross-platform – any objections (likelihood of me actually find time to start it hovering around 0.00001%, mind you)? Nice work Jono! What are the chances of generalizing this, so the App Indicator Menu can include other channels, or a customized list of channels? Is there any top to bottom solution on how to build and distribute an Ubuntu application? I can pull up Python today and make some simple scripts, and I’m certain with five or ten minutes of time I can learn to browse through the snippets compendium (or what it’s called) and start making a simple GTK tool. But how to redistribute it, make a package for Ubuntu, or even provide a PPA? I have no idea how to do these things. Does the Quickly/Project Awesome Opportunity have any plan for an integrated top-to-bottom system for not only application prototyping, but packaging, and distribution/integration into the Ubuntu app store? @twilightomni I don’t know about getting it into the Ubuntu app store, but Quickly does all the packaging and integration with LaunchPad for you. LaunchPad gives you a version repository (Bazaar), issue tracking, and a distribution mechanism (PPA thingy), so I think it’s what you’re after, AFAICT. I haven’t looked at it in detail, so I’m happy to be corrected, but I thought that’s what it gives you. If you create your app with Quickly, which is the recommended approach, you can package it by just running ‘quickly package’ and you can publish it to a PPA by just running ‘quickly release’. Simple! One command to create a package and a PPA?